In a bustling restaurant of excited chatter and shouting toddlers, Kaidi Wu is the opposite of her surroundings. Her voice is like a spring breeze—gentle and slow, serene and unhurried. She seems to emerge from a different world, a realm of tranquility and grace. 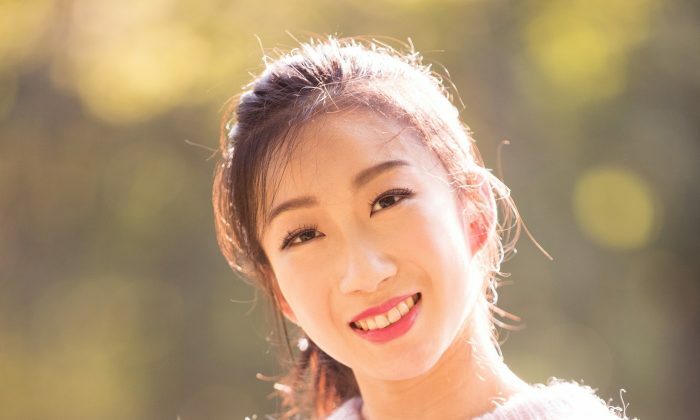 Now, Kaidi is a principal dancer with the performing arts company that inspired her dream, and she has come to embody the ethereal beauty that had mesmerized her when she first saw Shen Yun. Dressed in a flowing white gown adorned with yellow and blue, Kaidi flurries a pink silk cloth and floats across the stage as if carried by a cloud in New Tang Dynasty (NTD) Television’s 2012 International Classical Chinese Dance Competition. There’s a twinkle in her eyes, a smile on her lips. Immersed in Kaidi’s self-choreographed piece, audiences can almost see the rippling waters in a turquoise lake, feel the gentle breeze of a balmy morning, and hear the chirping swallows in a secluded valley. How does a dancer capture such beauty, we wonder. “This kind of beauty should be the natural reflection of your inner self,” Kaidi tells us. It’s not about outward appearances, but instead about the channeling of inner virtues. Thus, classical Chinese dance cannot be separated from the cultivation of a kind and virtuous character. This past September, in NTD Television’s recent competition, Kaidi chose to perform the role of Wang Baochuan. From an aristocratic family, Wang Baochuan had fallen in love with the commoner Xue Rengui because he was a kind man of excellent character. After they married, he rose up the ranks to become a Tang Dynasty general and was away on the battlefield for many years. Living alone in a crude cave dwelling, Wang Baochuan “had to overcome all kinds of hardships. But she was not fearful, and she simply persisted in waiting,” Kaidi says. Eighteen years later, she was finally rewarded when she reunited with her beloved husband, who had returned triumphantly from the battlefield. Kaidi says that in Wang Baochuan, she saw loyalty, perseverance, and selflessness—all characteristics she admires. As part of Shen Yun Performing Arts, Kaidi is not only reviving traditional Chinese dance but also showcasing the values of the ancients. Back then, the paragon of a Chinese woman epitomized refinement, grace, and virtue, things swept under by the tides of modernity. When speaking about the challenges of learning classical Chinese dance, Kaidi reveals that her biggest challenge was mental, not physical. A teacher once told her that she was not steady enough as a dancer, as if holding her breath on the surface. She was like a leaf that drifted about at the whims of the breeze. “I easily became nervous,” Kaidi says. Over time, she realized the source of the problem. “I worried about how others would view me. If I thought about myself, I would become more nervous.” She thus had to learn to calm her mind and dispel the insecurities that distracted her. For Kaidi, handkerchief dances have always been especially challenging. One of the most impressive parts of the dance is when a dancer twirls her handkerchief into the air, performs a front aerial, and then successfully catches the handkerchief before it falls to the ground. As she worried about potentially failing to catch the handkerchief, she would do poorly. “When we perform, we shouldn’t think about ourselves. Just think about what you should do with a steady, unwavering heart,” Kaidi says. Beginning in 2012, Kaidi was given lead roles in dances in Shen Yun’s world tours. Her new roles brought on more responsibility, and it became more important for her to maintain a steady mindset. “You can’t stand out by yourself,” Kaidi says. Instead, she strives to assimilate to the larger body, to perfect the performance as a whole. “We are all doing the same thing. One person’s strength cannot match what the group has as a whole,” Kaidi says. Over time, she learned to focus less on herself and to adapt to those around her, putting their needs above her own. Only then could her performances truly move audiences. As a dancer, Kaidi evokes not only the grace of celestial fairies and imperial palace maidens but also the dignity of modern-day heroes. In Shen Yun’s 2017 world tour, in the piece titled “A Child’s Choice,” she played an orphaned girl who later discovers the truth behind her parents’ deaths. As practitioners of the Chinese spiritual discipline Falun Dafa, they had been brutally killed by the Chinese communist regime for their faith. The dance’s storyline draws from real events occurring in China. The spiritual practice of Falun Dafa once had an estimated 100 million adherents in China. But in 1999, the Chinese Communist Party ordered a nationwide persecution, beginning 19 years of brutality and inhumanity that continue to this day. Instead of succumbing to the pressure of the persecution, Kaidi’s character continues her parents’ legacy, standing up for what is right. At the end of the piece, she resolutely unfurls a banner with the Chinese characters for truthfulness, compassion, and tolerance—the central tenets of Falun Dafa. Her determination and fearlessness move audiences to tears. Growing up in a family of Falun Dafa practitioners, Kaidi had personally experienced the far-reaching claws of the Chinese Communist Party’s persecution. When she was living in China with her grandparents (her parents had immigrated to Canada first), their home was raided by police because they practiced Falun Dafa. At elementary school, Kaidi was discriminated against, forcibly held back one year, and sometimes bullied by her classmates, who once hit her with a water bottle. At the time, young Kaidi was simply bewildered. It wasn’t until she was about to leave China that she came to realize she had been treated unfairly because of her family’s faith. As our interview concluded, we set off for a photo shoot in a nearby park. At our last stop on the sandy beach of a lake, we asked Kaidi to perform a few dance poses and leaps. She found a nearby wooden pole to lean on as she stretched, and she pressed on it two or three times to check its sturdiness. In the next second, she had kicked her leg effortlessly behind her head to form a straight line pointing to the heavens. As she took off her sneakers for the photo shoot, we saw that her toes and heels were covered in scars, the battle wounds of a professional dancer. But she seemed not to notice the existence of these wounds. Wearing an unadorned black shirt, she leapt into the air with the brilliant colors of sunset as her backdrop, blossoming in time that seemed to stop. Her silhouette was like an imprint of her many years on stage, a decade of stirring splendor. Through it all, we see the warm smile on her face, gentle and sincere, accompanied by the radiant hues of twilight. Published with permission from Elite Lifestyle Magazine. “It's explosive! A lot of exploding silk and just explosive movements,” said performance artist and dance instructor Lois Wood, enthralled by Shen Yun Performing Arts. "I think it's the traditional values that Chinese people have cherished throughout centuries, or millennia I should say."